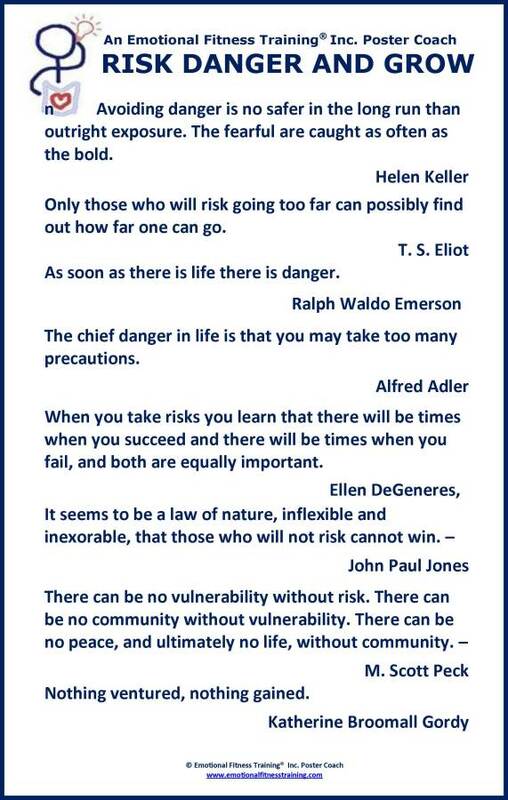 Are you a risk taker or do you like the safe route through life? Most of us are a bit of both. What about your kids? Worried about their risk taking, this one is for you. But first an Emotional Fitness Training Poster Quote. The last quote was pounded into my head by my mother. I don’t actually remember hearing her say it that often, but she most have, for when fear tries to hold me back, I rev myself up with that quote. Now, I was a shy child, and believe it or not in many situations shyness still holds me back. Those who have seen me lecturing or giving a workshop are right to scoff a bit, and in some situations I burst forth. I did stand up on Oprah and do my thing. Shy children need gentle and constant encouragement. That’s what worked for me. Marry my mother’s “Nothing ventured” idea to mistakes are for learning provides children with a powerful message that builds courage. What about the child that takes so many risks the local emergency room jokes about giving him a room of his own? A different story. He need a professional evalutation. Tip one: Start safety training early. I had a loosy-goosy friend when my kids were growing up. She was big on “Letting kids do their thing.” She had one bee in her bonnet, however. That bee? Safety. Her kids were among the first to wear helmets, but where her training shined brightest was in the seat belt drill. Seat belts were relatively new way back then, and lots of families didn’t stress the Buckle Up bit. She did and it worked. Before her kids behinds hit the seat, they were pulling on their seat belts. Tip two: As soon as your little ones start recognizing words, teach “Safe” and “Danger.” My not yet two-year-old grandson knows “Danger” means come to an adult and hold their hand. He learned that on walks and mostly when it came to crossing streets, but also when approached by a dog eager to be petted. Tip three: Teach the art of rating things. Do this in general and not specifically related to danger. Any thing can be rated and should be, it is a major emotional fitness tool and teaches a child not to sweat the small stuff. In time you want to use a 10 point scale. Put the extreme at either end. The average in the middle and then work up and down the scale. See the Wiki How article I started on how to take a feeling thermometer – feeling thermometers are rating scales. Start with the falls that go with early childhood, but don’t use numbers yet. Use Really Big Hurt for broken bones and trips to the doctor for stitches. Big Hurt the falls or hurts that send have your child coming to you for a hug or need a band-aid. Little hurt for when you see the child is looking to you more for attention than anything. Add the words “Pop up.” to encourage sucking it up. “Good job” are for when the child falls hard, but pops up and goes on with playing. As the child begins to learn numbers you can add them, but don’t get too fussy about the child knowing the number. Just assign the number you feel measures the hurt and display the proper amount of sympathy. Little or no sympathy for small hurts then more sympathy as the hurt mounts. One day, your child will surprise you and rate the hurt before you do. That is if you are consistent. Teaching skills requires consistent practicing. Tip four: Involve your child is a sport that involves body control, bumps and bruises and pay for some professional training or coaching if possible. My first choice is Aikido which provides peace oriented self-defense course. Here is a link to what I call the Peace-Minded Karate School. I had one such dojo teach Aikido to the kids at the Family Support Center I ran. Tip five: Have safety drills. These can range from putting on the seat belts when you get in the car, to helmet up for skateboarding to middle of the night fire drills. What if your child is a teen and you are only beginning to worry about his or her risk taking? Get the free down load of my book When Good Kids Take Risks. It is available until midnight June 11th. See the side bar. Also, read tomorrow’s post for I will talk a bit there about teens and risk taking. More kids than not survive the teen years. The few risk takers – adults and kids that don’t survive are the stuff of headlines. Moreover as some of the quotes showed, you danger and hurt are part of life whether you take risks or not. I suggest if you can’t sleep nights for worrying about your kid professional help may be needed. If the kid isn’t always need bandages or worse, you may need the help. If the kid needs medical care more than once because of risky behavior, he also needs a professional mental health evaluation. Either way and just for your own health, think about getting my eBook on self soothing. Costs less than a fudge sundae and is better for your health. For a sample of a self soothing exercise, try my Be With Beauty Emotional Fitness Exercise. It is perhaps the easiest of my Twelve Daily Exercises, but given time and practice guarantees a quick break when stress mounts. Thank you for caring, sharing, and all the other things you do to make your corner of the world better. This entry was posted in Parenting Issues and tagged Aikido, Emotional fitness, Emotional Fitness Training, Emotional Health, Katherine Gordy Levine, Keeping your kids safe, Oprah, Oprah tape link, Parenting advice, Peace Dojo, postaday, Risk taking in teens, Risky Behavior Tips for Parents. Bookmark the permalink. So true. If you over protect them, they will grow up fearful and never try anything. If you give them free riegn, they will not be aware of the dangers. A good balance is needed. A great post as always.